Rome: It’s hard to shake off the image in our minds of what a proper Roman meal ought to be like—or, to be more accurate, what Hollywood movies and pop fiction like to portray as authentically Italian. If you haven’t been to Rome recently, or spent enough time in parts of the city where the working class dine, then your idea of a typical Roman meal would probably be similar to what’s idealized in holiday brochures and travel shows on TV: extended hours of animated chatter in a rustic trattoria over a multi-course feast and cups of espresso. In reality, it’s not an entirely imaginary scene, but it’s more likely to involve wealthy Romans, out-of-towners on business, or tourists on holiday. Indeed, Romans still do spend an inordinate amount of time and money dining out, especially on weekend nights. But, like everywhere else in the world, it’s an expensive, time-consuming habit that’s slowly being replaced by the quicker alternative. A closer look at Rome’s history reveals a long tradition of outdoor dining and eating on the go. As the capital of an ancient empire and, later, of Western Christendom, Rome’s public dining infrastructure was perennially inadequate—notoriously unable to supply enough nourishment for the millions of pilgrims that visited the city’s temples and cathedrals. Enterprising locals made up for the shortfall with makeshift stalls selling fresh produce and packed food or what modern gastronomes would call grab-and-go meals today. Apparently, fast food is nothing new but, in food-obsessed Rome, only the best ones have survived over time. Likewise, the enduring passeggiata, the ritual evening stroll at the end of the workday, has helped guarantee the survival and quality of the city’s street food tradition. Because of this, Romans, and Italians in general, have developed the unique skill of snacking on the move—expertly juggling their gelato or slice of pizza rustico in one hand, while gesticulating vigorously or chatting on a mobile phone with the other. Few things come between a Roman and his daily fix of espresso or, as it’s called in Rome, caffe. Along with a simple brioche, it’s how most locals start each morning and, for some, end the day. It’s not unusual to have multiple cups during the day and, despite the proliferation of home espresso machines capable of barista-quality coffee, Romans still insist on queueing at the corner coffee shop for a chance to meet neighbors and exchange a quick round of gossip while waiting in line. For most Romans, coffee should always be served and enjoyed at the counter. Although the term espresso suggests an instant drink, it actually takes longer for a barista to prepare a single shot (25 to 50 ml) than it takes a customer to drink it. Except when taken after a meal or during the middle of the day, Romans are in and out of a coffee shop in a huff and you can spot a tourist instantly as they’re the only ones who linger over a cup while seated. But no matter the rush, Romans would rather gulp the brew than order it to go in a paper cup. In the vicinity of the Pantheon and Piazza Navona are two of Rome’s most celebrated coffee houses. Easier to spot in the southwest corner of Piazza della Rotonda along Via degli Orfani is Tazza d’Oro. Established in 1946, the busy café isn’t the oldest in Rome but it was the first to be granted a license to roast beans on site. Today, the delicious aroma of fresh roasted beans pervades the lovely art deco shop and, despite the crowds, a cup or two of the house blend La Regina dei Caffe is worth lining up for. A short walk from Tazza d’Oro in a back street of the Pantheon is the Piazza Sant’Eustachio, where a café that takes its name after the charming square has lured locals and travelers alike since 1938. Unlike its rival close by, the tiny square where Il Caffe’ Sant’Eustachio stands is never as busy, and the only crowd one comes across is of loyal customers in line for one of the best cappuccinos and espressos in the city. The coffee is so good, I’d gladly endure the jostling for a position at the counter and the five- to 10-minute wait to be served. It’s a standing room only affair at this small café and when it gets too crowded, customers don’t mind taking their coffee at the square outside. Many of the best coffee shops in Rome aren’t listed in guidebooks, and the baristas in these establishments often show little patience for fumbling foreigners. For the uninitiated, it always helps to visit a café with a long tradition of serving an international clientele as an English-speaking staff is better at deciphering your poor Italian and wrong coffee terminology. In terms of style and heritage, none in Rome rival the Antico Caffe Greco along the fashionable Via dei Condotti directly across the Spanish Steps. The historic shop has been serving coffee and tea in the same location since 1760, making it the oldest in Rome and the second oldest in the world. Foreigners enticed by the elegant interiors of the historic landmark rightly insist on having their drinks in the opulently decorated salon within, but locals passing through Rome’s premier shopping district always prefer to have theirs standing at the counter up front. Acqua Roma: Even the proudest locavores readily admit that the best coffee in Italy comes from Rome. Part of it has to do with the long tradition of roasting beans and the high standards set for baristas in the city. But the unacknowledged secret behind Rome’s reputation for serving the best brew is the quality of water that flows from the hills around Rome via the city’s ancient aqueducts and directly to fountains and households all over the city. Tourists in Rome are reluctant to follow locals who drink directly off the street fountains—and the fear is understandable. In most parts of the world, public fountains are purely ornamental, and the water unsafe for drinking. In Rome, however, fountains provide the population with the freshest and cheapest supply of drinking water and the only time you’ll notice Romans drinking from a bottle of acqua minerale is when they dine in a restaurant. We have a succession of public works-minded emperors and Catholic popes to thank for the aqueducts that were built and repaired over the millennia. Much of Rome’s supply is sourced from the small village of Tivoli, from a spring formed by rainwater gathered at the Alban hills outside the city. But the best quality, they say, is sourced from two aqueducts, the Acqua Peschiera and the Acqua Pia Marcia some 40 to 50 miles away. If you want to feel like a local, try to resist the temptation of filling an empty water bottle with liquid from a fountain. Instead, simply bend over and cup the water with one hand—it’s the fashionable way in Rome. Slightly sweet and always cold, Rome’s water is the only great gastronomic delight in the city that’s free. Pizza rustica: Although Naples is the birthplace of the pizza as we know it, the Roman variety known as pizza rustica or pizza al taglio (by the slice) is served with a thinner, crispier crust compared to the more popular Neapolitan type that inspired pizza dishes around the world. In Rome, like anywhere in Italy, pizzas are ordered as a complete meal in itself and served whole for a single diner. In contrast, the concept of the takeaway pizza slice is rather new and some suggest it’s an American invention that found its way back to the Italian motherland. Whatever its origin, a takeaway slice is the perfect way to enjoy a genuine Italian delicacy on the move. Pizza rustica is sold by the slice: I used to think that sliced pizza was only popular with budget conscious travelers or with tourists short on time. But try standing in line at any of Rome’s traditional bakeries and you’ll see that locals have grown fond of it as well. My favorite bakery for sliced pizza is Il Forno Campo de’ Fiori in the historic square of the same name. Unlike the round pizzas served in restaurants, Il Forno’s are baked as long sheets in the oven, and, when done, cut according to the customer’s preference and priced according to weight. What you get are broad rectangles rather than the narrow triangles we’re accustomed to. The shape makes it easier to balance in one hand and thus better suited for eating on the go. The specialty of Rome is pizza bianca (“white pizza’, a sheet of pizza crust with just the slightest hint of melted ricotta cheese for topping, plain or seasoned with coarse salt, rosemary, and olive oil. It’s just one of countless varieties that are sold by the slice, although Romans have a particular preference for meatless pizza rustica. Another local favorite is pizza with arugula, pine nuts, and crumbled ricotta on top of sparsely spread tomato sauce. Mercato Campo de Fiori: The Roman preference for a vegetable- and seafood-based cuisine can be traced to the influence of the Jewish community that settled in Rome during the days of the Empire. The area around the Campo de’ Fiori was once the Jewish quarter of the city and Romans would come for the popular fish and vegetable markets that once flourished here. Campo de’ Fiori today is the location of one of Rome’s most colorful outdoor markets. The fresh fruits and vegetables on sale every morning from Monday through Saturday represent the best produce from the Italian countryside: San Marzano tomatoes; Sicilian oranges; lemons from Amalfi; cherries from Modena; artichokes from Rome, just to name a few. Since most vendors wash their products beforehand, purchasing a basket of fresh fruit at the market serves as an ideal alternative to having dessert at a café. Roman alimentary: For a taste of hearty Roman fare, a visit to a traditional grocery or alimentari offers a wider selection of authentic choices. Located south of Campo de’ Fiori along Via dei Giubbonari is Salumeria Roscioli, one of Rome’s top gourmet delis. Fortunately, for shoppers, there are a few tables and chairs where the items purchased at the traditional Roman grocery can be sampled and, for serious wine buyers, a private tasting room tucked inside. A popular dish at Roscioli is Roman-style roast pork or porchetta alla Romana sold by the slice as takeaway or eaten on the premises. The local delicacy of milk-fed baby pig stuffed with fresh herbs, garlic and spices, and roasted whole is an accurate representation of cucina alla Romana: honest, direct, unadorned, but never austere. Indeed, all it takes is one bite of the succulent pork to be reminded that the ancient Romans coined the word “gusto”— a term we still use today to describe a healthy appreciation for good food. Another Roman favorite similar to porchetta is abbachio: whole, spit-roasted, milk-fed baby lamb seasoned with rosemary. The local variety can be cooked in the oven with olive oil infused with anchovy sauce and seasoned with vinegar, garlic, and rosemary. Both the porchetta and abbachio go extremely well with another ancient Roman delicacy: carciofi alla giudia or Jewish-style artichokes deep-fried in olive oil. A heavy meal like this is never complete without a sweet pastry or slice of cake along with a mandatory cup of cappuccino or caffe. Roscioli’s fresh-baked products are just as popular as their cooked meals and their tortine al pistacchio, a scrumptious cake made with pistachio nuts, is often sold out by midday. Picnic fare: Unlike Roscioli, most of Rome’s traditional groceries and butcheries don’t encourage dining in the premises, which is not a problem when the weather is good outside. Rome isn’t a city of sprawling public parks and the few ones like the Villa Borghese can be dodgy in certain parts. Rome is better known for its pocket gardens but, unfortunately, most are privately owned and closed to the public. However, there are numerous piazzas in the city and quite a few public gardens that allow you to enjoy a picnic in comfort and safety. One of my favorite spots for a picnic is the scenic Giardino degli Aranci, the lovely garden of oranges overlooking the ancient skyline. Few tourists bother to climb one of the highest of Rome’s seven hills and those that do come only for a quick photo opportunity and leave instantly. With the most spectacular views of the city from above and the scent of ripening oranges filling the air, the tranquil garden is a rare oasis in one of Europe’s most congested capitals and the ideal site for dining al fresco while watching the sun set over the city. The tranquil Giardino degli Aranci is an ideal spot for picnics in Rome. In the area, the best source for packing a picnic is Volpetti along Via Marmorata in the neighborhood of Testaccio. The local institution has been called a temple of gastronomy and the high quality produce and rare ingredients sold at the store confirm this reputation. The choice of charcuterie is mind boggling, with a wide variety of Italian salami and prosciutto available. Volpetti also stocks a huge selection of hard and soft artisanal cheeses from every region of Italy. There are also pizzas, panini, and cooked dishes for takeaway, but I suggest sticking to cheese and charcuterie along with fresh baked bread plus a bottle of wine for your garden picnic close by. Further from the historic center, working class Testaccio may not have any landmark of note but what it lacks in tourist attractions, the neighborhood more than makes up for in food choices and what is arguably the city’s best farmer’s market. The area is also the ideal place to sample Rome’s cucina povera—a version of frugal cooking that’s currently trendy in Italy. Testaccio was once where the city’s slaughterhouses were confined and whatever parts of the animal were deemed unfit for sale to the city’s patrician households were consumed by the poor residents of the area. 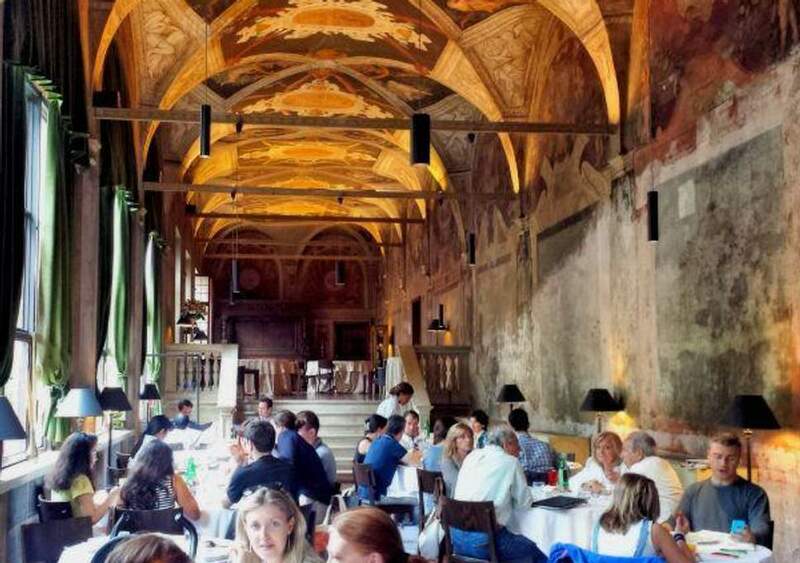 Today, gourmands from all over Rome and Italy come to Testaccio to sample working class dishes like oxtail stew or coda alla vaccinara in the same neighborhood where it was first perfected. For diners on the go, a classic Roman delicacy commonly found in the working class district is suppli, fried rice balls with a variety of ingredients ensconced within. Traditionally, offal and other offcuts were featured in suppli, but modern tastes have prevailed and you’re more likely to find mozzarella, eggplant, or ground beef inside the tasty rice balls today. Suppli should not be confused with the Sicilian variety called arancina, although both versions of the fried Italian delicacy are equally perfect for munching while walking through the neighborhood. Gelati for the passeggiata: If there’s one treat in Rome that’s tailor made for dining on the move, it’s definitely Italian gelato. Unlike ice cream sold outside Italy, gelato has a softer and more elastic texture. With less air, sugar, and fat, gelato is also much lighter, yet more intense in flavor. There’s no missing a gelateria in Rome, there are hundreds all over the city, and it’s not uncommon to find them operating side-by-side until late at night. If coffee is what Italians have to start the day, a gelato is how they prefer to end one. It’s the ultimate gastronomic companion for the nightly passeggiata tradition. There is no such thing as bad gelato in Rome but some are definitely better than others. To be sure you’re getting the best quality, look for the label “artigianale” on the shop sign. It means the gelato is artisanal or made fresh on site—not mass-produced in a factory. The two establishments with the most loyal followers in Rome are San Crispino near the Trevi Fountain and Giolitti in the neighborhood of the Pantheon. Because of their incredible popularity (San Crispino was featured in the movie Eat, Pray, Love starring Julia Roberts), tourists outnumber locals at these gelateria but, fortunately, the quality of the gelato remains worthy of the accolades. In San Crispino, I strongly recommend the zabaione, a rich Sicilian gelato made from cream, egg yolks, sugar, and marsala. At Giolitti, the Nutella gelato or chocolate hazelnut ice cream is a timeless classic that never fails to draw the faithful to this elegant parlor. Fior di Luna in the Trastevere on the left bank of the Tiber is my current favorite. They pride themselves in small-batch production, and since they only use ingredients that are in season, the flavors are constantly changing. Fresh fruit-based gelato is their specialty and flavors like strawberry and cherry are a refreshing palate cleanser after a meal in Rome’s most lovely neighborhood for outdoor dining.